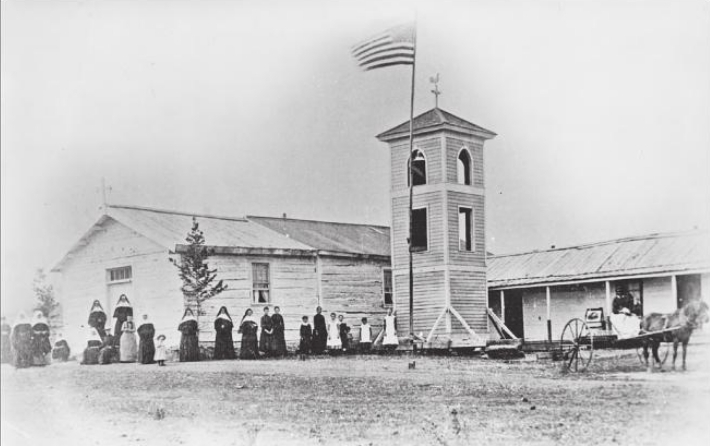 During the nineteenth century, Catholic priests and Ursuline nuns traveled to the Western United States in order to preach their religion to Native peoples. Facing many challenges, they often found the West’s landscape unforgiving. St. Peter’s Mission was no different. 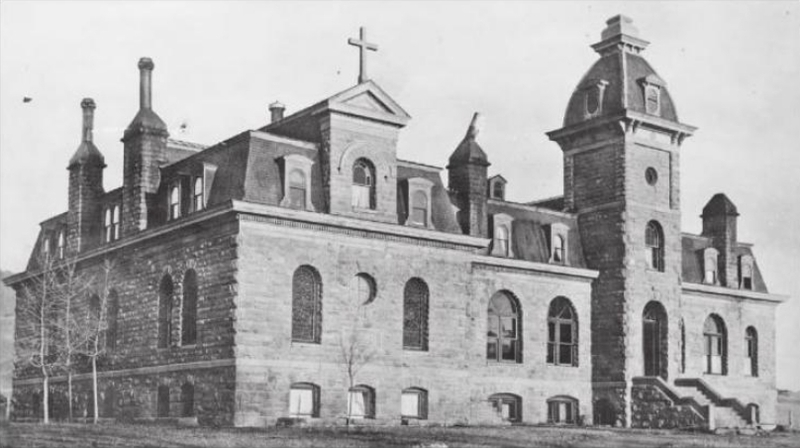 One of Montana’s first Catholic missions built for the Native Americans, St. Peter’s was plagued by problems from the beginning. While only a small, white wooden frame church is all that remains of the St. Peter’s Mission today, when it was first built, the Mission was an arresting stone structure bustling with students, nuns, and priests. Constructed under the direction of Father DeSmet—who is believed to have baptized the first Blackfoot in the area—St. Peter’s mission faced severe trials almost instantly. In order to survive, the Jesuits and Blackfoot had to rely on farming. The Blackfoot agreed to move their lodges nearer to the mission to farm, but never received the agricultural supplies they were promised. The Jesuits lacked supplies as well. Some have described St. Peter’s early years as a lingering existence of a prolonged agony. After a decade of trying to survive, the Jesuits regrouped and decided to focus their efforts on growing the mission. They built a school for white and Native American boys and tried more earnestly to conquer the landscape. However, a deadly winter famine brought starvation and hardships. Despite the harsh conditions, the boys’ schools began to be successful, and the Jesuit priests resolved to begin a girl’s school as well. Calling on the formidable and admirable Ursuline Mother Amadeus Dunne for help, soon the Ursulines had created a small school for young Indian girls. The Ursuline nuns were not immune to the difficult environment, and they too struggled between survival and trying to make the mission prosper. Receiving little to no financial help from their eastern counterparts, the Ursulines were barely subsisting when the Jesuit priests decided to abandon the Mission. The Ursulines then had a choice on whether or not they too would abandon the mission. When two ravaging fires destroyed many of the buildings, the decision was made for them. St. Peter’s Mission was abandoned—a stark reminder of the Catholic missionaries’ lonely battles with the Western terrain. 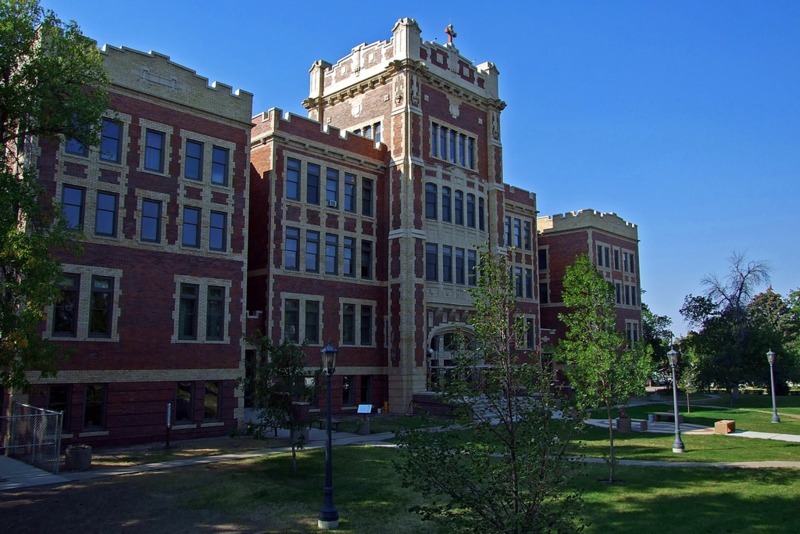 Ursuline Academy: This building is now part of an academy created in 1971. Today, it houses classrooms. ~ Source: https://commons.wikimedia.org/wiki/File:Ursuline_Academy_(2012)_-_Cascade_County,_Montana.png. Group of Ursuline Nuns at the Mission: A group of Ursuline nuns with some Native Americans at St. Peter's Mission. From left to right, the nuns are: Mother Mary Amadeus Dunne, Sister St. Ignatius, Sister St. Thomas. 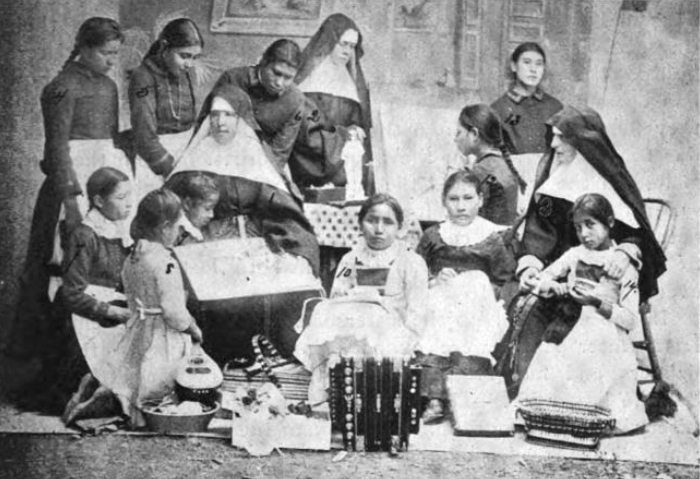 These nuns helped to run a boarding school at the mission. ~ Source: https://commons.wikimedia.org/wiki/File:Mother_Amadeus_-_Sr_St_Ignatius_-_Sr_St_Thomas_-_pupils_of_St_Peters_Mission_-_near_Cascade_Montana_-_late_1897.jpg. Survey of Ruins: A priest and some nuns survey the ruins of a boy's school nearby to the mission. 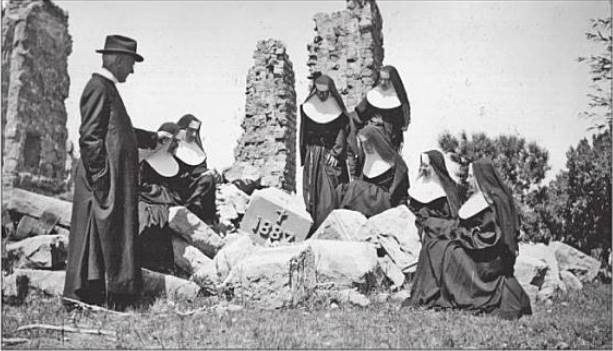 ~ Source: https://commons.wikimedia.org/wiki/File:Priest_and_Ursuline_nuns_survey_ruins_of_boys%27_school_-_St_Peters_Mission_-_near_Cascade_Montana_-_c_1887.jpg. St. Peter's Mission: Several Ursuline Nuns with some Native American students. ~ Source: https://commons.wikimedia.org/wiki/File:St_Peters_Mission_-_near_Cascade_Montana_-_1884.jpg. St. Peter's Mission: This photo, taken before 1908, shows the St. Peter's Mission on Birch Creek, now known as Mission Creek. ~ Source: https://commons.wikimedia.org/wiki/File:St_Peters_Mission_Montana_-_pre_1908.jpg. 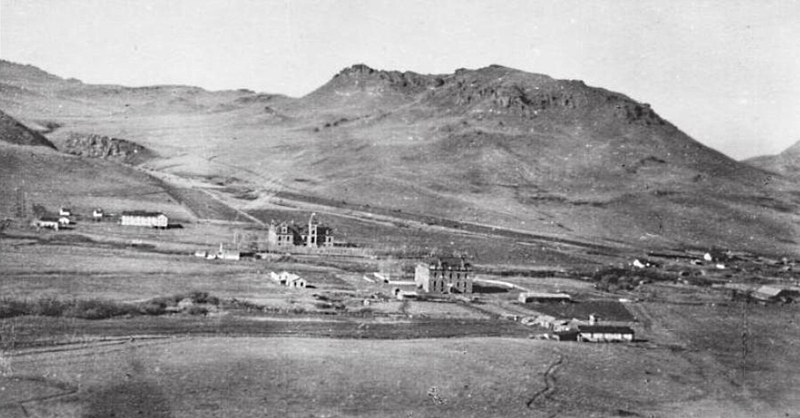 Ursuline Convent: The Ursuline Convent is shown here in 1892, shortly after its completion, ~ Source: https://commons.wikimedia.org/wiki/File:Ursuline_Convent_-_St_Peters_Mission_-_near_Cascade_Montana_-_c_1892.jpg. Dani Carmack, Brigham Young University, “St. Peter's Mission,” Intermountain Histories, accessed April 19, 2019, https://www.intermountainhistories.org/items/show/124. Schoenberg, Wilfred P. “Historic St. Peter’s Mission: Landmark of the Jesuits and the Ursuliens among the Blackfeet.” Montana: The Magazine of Western History 11, no. 1 (Winter 1961). JSTOR. Cataldo, Joseph Mary. ‘Kuilks metacopun’ (Black Robe three-times-broken): Being a series of interviews with Fater Joseph Cataldo. Wallace, ID: Wallace Press-Times, 1925. Sterling, Lydia. “Leaves from the annals of the Ursulines.” Catholic World 66 (October 1897): 319-773.